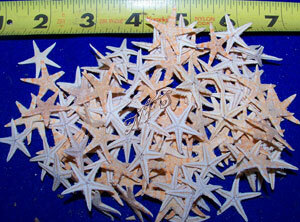 These starfish measure around 3/4" - 1 1/4" Real dried Natural Flat Tan Philippine Craft Starfish. Please note in this species of starfish will have some missing points. They are very fragile. This is why we always add extra to all bags. These are the most fragile item we sell. Again, they do have missing points and get damaged in shipping, They may also be larger or smaller than listed. Please be aware we are not selling selects in these species of starfish and the bag will have many with missing points in every bag. If this is a problem do not buy them then complain about missing points. We have crafters that use them with or without points and hermit crab owners that use them for food. This is why we add extra to every bag. This species will have a dead odor. Sorry no special requests for specific sizes. Some or many will have missing points. Perfect for crafts, Crab food and more.